Introduction Intramedullary fixation of the metaphyseal fractures of the tibia with a short proximal or distal fragment is associated with an increased rate of malalignment. The use of blocking screws (Poller screws) bedside the intramedullary nail narrows the medullary cavity and decreases the degree of nail translation and malalignment. Patients and methods Between January 2012 and May 2013, 20 cases of metaphyseal tibial fractures were included in the study. There were 12 males and eight females, with the mean age of these patients was 36 years (range: 19–60 years). Fracture site was the proximal segment in seven cases and the distal segment in 13 cases. Intramedullary fixation supplemented by blocking screws was done in all cases. Results The average duration of the follow-up was 33 weeks (range: 19–54 weeks). A total of 16 patients achieved union with maintenance of the alignment of their fractures. One patient progressed to 5° of valgus and healed at this position, and three patients had persistent 2° of varus deformity. One of these patients experienced fissure fracture at the site of blocking screw. Delayed weight bearing and casting was done for 6 weeks, and the fracture was healed with 3° of varus of the proximal segment. Conclusion This technique is recommended to treat proximal and distal tibial fractures that minimizes the malalignment rate and allow early return to activities. Intramedullary nailing is the standard method in the surgical treatment for tibial mid diaphysis fractures ,. Unlike intramedullary fixation of diaphyseal fractures of the tibia, nailing of metaphyseal fractures with a short proximal or distal fragment is associated with an increase in malalignment, particularly in the coronal plane. The cause has been attributed to both displacing muscular forces and residual instability at the fracture site . As there is a large difference between the size of the implant and the metaphyseal diameter with no nail-cortex contact, the nail may translate laterally along coronally placed locking screws. The use of blocking screws (Poller screws) was first defined by Krettek and colleagues ,. These Poller screws decrease the width of the medullary cavity, physically block the nail, and increase the mechanical stiffness of the bone-implant construct. The term ‘Poller’ is derived from small metal devices placed in roads to block or guide traffic . Use of a blocking screw does more than just narrow the medullary canal. Its role is to correct imbalanced soft tissues that cause axial displacement. Soft tissue tension is neutralized by means of a three-point arrangement analogous to a tension-band construct. If biplanar displacement is present, then two screws can be used, one in each plane . In this study; we present a prospective follow-up of the patients with proximal and distal one-third tibial fractures treated with intramedullary nail and blocking screws. During the period between January 2012 and May 2013, 20 patients (12 males and eight females) were presented with metaphyseal tibial fractures. The mean age of the patients was 36 years (range: 19–60 years). The mechanisms of injury included motor car accident in two patients, motor bike accidents in seven patients, pedestrian struck by motor vehicle in nine patients, fall from height in two patients. Patients were eligible for inclusion criteria if they were skeletally mature with distal tibial metaphyseal fractures or proximal tibial metaphyseal fractures, closed extra-articular fractures and traumatic injuries. The criteria for exclusion were proximal and distal tibial articular fractures, open fractures and pathological fractures. The study was approved by the institutional ethics committee in accordance with the ethical standards of the 1964 Declaration of Helsinki as revised in 2000. Informed consents were obtained from all patients before the operations. Seven cases presented with proximal third fractures and 13 presented with distal third fractures. According to the Orthopaedic Trauma Association (AO/OTA) ; these fractures were classified according to their predominant fracture as 41A (four cases), 42A (three cases), 42B (five cases), and 43A (eight cases). According to Tscherne classification  of soft tissue injury for closed fractures, there are six patients of C0 in which there is little or no soft tissue injury, eight patients experienced superficial abrasion (C1), and six patients with deep abrasions (C2). In C2 lesions, we waited for improvement of the skin condition before the operation. The patients were positioned supine on a radiolucent fracture table. A tourniquet was applied to the proximal thigh. The limb was prepared and draped in the standard sterile fashion. A transpateller approach was used for nail insertion. All procedures were performed in a single session and none of the fracture sites were opened for reduction. In proximal fractures, the blocking screws were placed freehand through a percutaneous wound into the distal portion of the proximal fracture fragment before nail insertion. The orientation and location of these screws depended on preoperative and intraoperative fracture alignment. To limit apex anterior angulation, blocking screws were placed posterior to the central axis of the tibia so that the nail would pass anterior to the blocking screw. To limit valgus angulation, blocking screws were placed lateral to the central axis of the tibia, so the nail would pass medial to the blocking screw. To limit varus angulation, blocking screws were placed medial to the central axis of the tibia so that the nail would pass lateral to the blocking screw. The starting point of the nail was obtained using an awl with fluoroscopic guidance. A guide wire was placed past the blocking screw(s) and across the fracture. Longitudinal traction and appropriately directed forces were manually applied to the limb to obtain provisional alignment during passage of the guide wire. Reaming was performed over the guide wire. The reamers were pushed past the blocking screw without spinning of the reamer to minimize dulling of the screw. A tibial nail of the appropriate length and diameter was inserted over the guide wire. The nail was advanced gently past the blocking screw(s). Fluoroscopic images confirmed appropriate alignment of the fracture with the passage of the nail beyond the blocking screw(s) and fracture site. The nails were locked in standard fashion proximally with an outrigger and distally with a freehand method. In distal fractures after obtaining a provisional reduction, the nail is passed and fixed proximally with aiming device. A more accurate reduction is done under fluoroscopic control, and the blocking screw(s) was inserted percutaneously. In fractures with preoperative varus or valgus angulation, an anterior–posterior poller screw is placed along the proximal medial side or lateral side of the distal fragment, correspondingly, to direct central passage of the nail. Insertion of the distal locking screw is done in a freehand technique. Closure of the surgical wound was done in layers [Figure 1] and [Figure 2]. 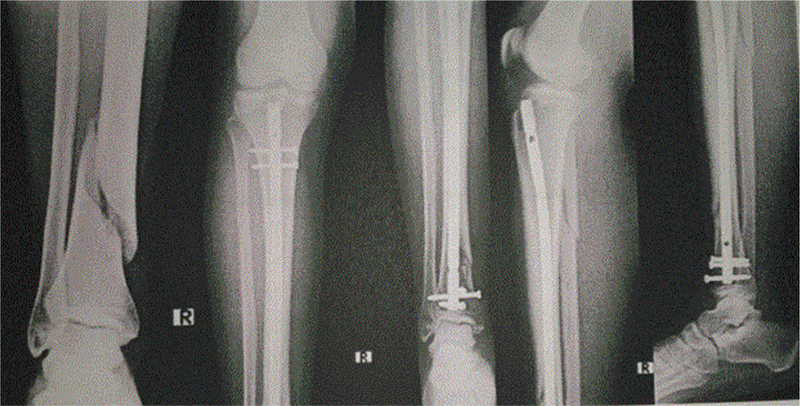 Figure 1 A case of distal tibial fracture with lateral translation fixed by intramedullary nail and two blocking screws on the medial side. Figure 2 A case of segmental fracture tibia with proximal metaphyseal part that was fixed by a nail and blocking screw. The patients received antibiotics (third-generation cephalosporins) for 5 days. Joint mobilization of both the knee and ankle joints was started on the second day postoperative. Removal of the sutures was done at 2 weeks postoperatively. Partial weight bearing was allowed (15–20 kg) till 6–8 weeks. Thereafter, weight bearing was increased based on the absence of pain and a study of the radiographs on follow-up. Radiographic films showing the whole tibia were done postoperatively. The patients were seen in the clinic every month. The clinical examination in these visits included an interview, physical examination, including a neurovascular examination and assessment of axial alignment, and a functional analysis. Functional recovery was assessed using Olerud–Molander ankle score . Olerud–Molander ankle score of 91–100 points was considered excellent, 61–90 points is good, 31–60 points is fair and less than 31 is poor. Anteroposterior and lateral radiographs were obtained postoperatively and at each follow-up visit. Fracture alignment was determined on each of these radiographs. Changes in alignment were reported. Malalignment was defined as more than 5° of angular deformity. Fracture union was defined radiographically as bridging cortical bone on at least two cortices combined with the ability to bear full weight on the extremity. Nonunion was defined as lack of any healing on plain radiographs within 6 months. The initial preoperative deformity can be defined into four groups. Group 1 with five patients had varus deformity (four the distal third and the other in the proximal third). Group 2 included seven patients with translation, six patients with lateral translation in the distal one-third and one patient with anterior translation in the proximal one-third. Group 3 included valgus malalignment in five patients, three of them in the distal third and two in the proximal third. Group 4 included apex anterior angulations in the proximal third of tibial diaphysis in three patients. The previous data are summarized in [Table 1]. The blocking screws position can be defined as follows; 12 screws were inserted in the medial side from anterior to posterior direction (for varus angulation and lateral translation) in 11 patients, who represent 55% of the sample (two screws were used in one of these patients); posterior blocking screws to the longitudinal axis of the tibia to correct the apex anterior angulation or translation in four patients, who represent 20% of the group; and blocking screws lateral to the nail and the longitudinal axis of the tibia to correct the valgus angulation were inserted in five patients, who represent 25% of the cases. These data can be summarized in [Table 2]. The postoperative residual deformity was found in four cases that were less than 5°. Three cases had with residual varus deformity, and one case had valgus deformity ([Table 3]). At the end of the follow-up period (mean of 33 weeks ranged from 19 to 54 weeks), 16 patients healed uneventfully. One patient progressed to 5° of valgus and healed at this position and three patients had persistent 2° of varus deformity. One of these patients experienced fissure fracture at the site of blocking screw. Delayed weight bearing and casting was done for 6 weeks, and the fracture was healed with 3° of varus of the proximal segment. Functional outcome at the end of the follow-up (Olerud–Molander ankle score) was excellent in nine cases, good in nine cases, and fair in two patients with residual malalignment. Surgical treatment of displaced tibia fractures can improve alignment and provide stability to the bone and the surrounding soft tissues. Stable fixation allows early motion of the adjacent joints, helping to maximize overall function . Although intramedullary nailing has been the treatment of choice for diaphyseal tibial fractures , its role in the management of fractures occurring at the proximal tibial metaphysis remains controversial, as high complication rates that mostly refer to unsuccessful reduction and malalignment have been reported . The most common deformities with intramedullary nailing of proximal tibial fractures are valgus malalignment, apex anterior angulation, and anterior displacement of the proximal fragment . The dynamic forces via the patellar tendon pull the proximal fragment into an apex anterior angulation, whereas the attachment of the pes anserinus commonly causes valgus stress on the same fragment . Valgus malalignment is also related to a medial nail entry point and a laterally directed nail insertion angle in the proximal fragment. Factors that have been associated apex anterior angulation included lack of a posterior cortex, the ‘wedge effect’ of the ‘Herzog’ bent of the nail and a distal starting point for nail insertion . Because of these factors, a significantly higher rate of tibial malalignment of the proximal third compared with other fracture locations was noted. Malalignment was seen in 58% of fractures of the proximal third, whereas in only 7% of fractures of the middle and 8% of fractures of the distal segment . Poller screws, placed adjacent to the nail and perpendicular to it, usually in an anteroposterior direction, have been suggested as one possible method for improving the stability of metaphyseal fractures and have been described as a reduction tool used to overcome the displacing forces . The use of a blocking screw does more than just narrow the medullary canal. Its role is to correct imbalanced soft tissues that cause axial displacement. Soft tissue tension is neutralized by means of a three-point arrangement analogous to a tension-band construct. If biplanar displacement is present, then two screws can be used, one in each plane. The blocking screw around the nail relieves axial strain in the fixation construct, whereas the interlocking screws through the nail control length and rotation . For the distal tibial fractures, intramedullary nailing of distal tibia fractures is technically demanding. Many problems arise from the anatomy of that region. The medullary canal of the tibia is hourglass shaped, such that a tight fit of the nail is only present in the mid diaphysis and not in the distal segment . To counteract these problems, several design modifications to distal tibial nailing have been introduced. Several authors suggested the use of a shortened standard tibial nail to diminish the distance between the most distal interlocking hole and the nail tip ,. Analysis of short nail construct was done in a cadaver study. Gorczyca et al. analyzed matched pairs of cadaveric tibias, with osteotomies extending 4 and 5 cm above the tibiotalar joint. The distal tibia fragments of 4 cm stabilized with shortened nails had comparable stiffness in compression and torsion to 5 cm distal tibia fragments stabilized with standard tibial nails. However, both constructs showed early failure following moderate compression-bending loads, thus supporting the principle of restricting weight bearing postoperatively to prevent loss of fixation and malunion . Several studies reported the obtained results after the use of blocking screws to stabilize proximal or distal tibial fractures. Krettek et al. studied 21 fractures of the tibial. A total of 31 Poller screws were used. The patients selected for placement of Poller screws had displaced fractures of the proximal (10 fractures) or distal (11 fractures) third. All fractures eventually united. Healing was seen at a mean of 5.4±2.1 months (3–12 months). The final Olerud score was excellent in three (17%) patients, good in seven (39%), satisfactory in six (33%), fair in one (6%), and poor in one (6%). At the time of follow-up, the mean varus-valgus alignment for all 21 fractures was −1.0±2.4° (−5 to 3). The mean loss of reduction between initial placement of the Poller screw and follow-up examination was 0.5±1.7° . Ricci et al. introduced a study that included 12 extra-articular fractures of the proximal third of the tibial shaft that were treated with intramedullary nails and blocking screws. A single posterior blocking screw was used in eight patients. A combination of one posterior blocking screw and one lateral blocking screw was used in two patients. Two medial blocking screws were used in one patient, and a single lateral blocking screw was used in one patient. Eleven of the 12 patients had postoperative fracture angulation that was less than 5° in the coronal and sagittal planes. One patient had postoperative malalignment of 6° valgus. In their conclusion, blocking screws are effective to help obtain and maintain alignment of fractures of the proximal third of the tibial shaft treated with intramedullary nails. The indications for this technique may be extended to other long bone fractures in which angular deformity can complicate intramedullary nail insertion .Seyhan et al. retrospectively reviewed 21 patients with distal tibial fractures. Blocking screws were inserted from the medial side in 18 patients through anterior to posterior direction in those with lateral translation and/or varus. One patient who had both lateral and posterior translation was blocked from both the medial side of the nail through anterior to posterior direction and the anterior side of the nail through medial to lateral direction, respectively. Two patients who had anterior translation only on the sagittal plane received blocking screw from posterior side of the nail through medial to lateral direction. Patients were followed up clinically and radiologically. Fracture alignment and union were monitored by radiography, and complications were noted. The most common problems to occur during blocking screw insertion were formation of a new fracture in the point of the blocking screw and the expansion of the existing fracture. They concluded that blocking screws could be used where adequate reduction cannot be achieved during the intramedullary nailing of distal tibial fractures . In this study, we used blocking screws with intramedullary nail in the treatment of proximal and distal third tibial fractures. They were seven cases with proximal fractures and 13 cases with distal third fractures. The patients were followed prospectively until fracture union on nonunion. All fractures were closed. All patients maintained less than 5° of angular deformity in the planes and healing was accomplished in all cases. Blocking screws are effective to obtain and maintain alignment of fractures of the proximal and distal third of the tibia treated by intramedullary nails. Schmidt AH, Finkemeier CG, Tornetta P. Treatment of closed tibial fractures. Instr Course Lect 2003; 52:607–622. Zelle BA, Bhandari M, Espiritu M, Koval KJ, Zlowodzki M. Evidence-Based Orthopedic Trauma Working Group. Treatment of distal tibia fractures without articular involvement: a systematic review of 1125 fractures.J Orthop Trauma 2006; 20:76–79. Freedman EL, Johnson EE. Radiographic analysis of tibial fracture malalignment following intramedullary nailing. Clin Orthop 1995; 315:25–33. Krettek C, Miclau T, Schandelmaier P, Stephan C, Möhlmann U, Tscherne H. The mechanical effect of blocking screws (‘Poller screws’) in stabilizing tibia fractures with short proximal or distal fragments after insertion of small-diameter intramedullary nails. J Orthop Trauma 1999; 8:550–553. Krettek C, Stephan C, Schandelmaier P, Richter M, Pape HC, Miclau T. The use of Poller screws as blocking screws in stabilising tibial fractures treated with small diameter intramedullary nails. J Bone Joint Surg Br 1999; 81:963–968. Stedtfeld HW, Mittlmeier T, Landgraf P, Ewert A. The logic and clinical applications of blocking screws. J Bone Joint Surg Am 2004; 86A(Suppl 2):17–25. Muller ME, Nezarian S, Koch P, Schatzker J. The comprehensive classification of long bones. Berlin, Germany: Springer-Verlag 1990. Oestern HJ, Tscherne H. Pathophysiology and classification of soft tissue injuries associated with fractures. In: Oestern HJ, Tscherne H editors. Fractures with soft tissue injuries. Berlin: Springer-Verlag; 1984. 1–9. Olerud C, Molander H. A scoring scale for symptoms evaluation after ankle fractures. Arch Orthop Trauma Surg 1984; 103:190–194. Valler HA, Le TT, Bedi A. Radiographic and clinical comparisons of distal tibia shaft fractures (4-11 cm proximal to the plafond): plating versus intramedullary nailing. J Orthop Trauma 2008; 22:307–311. Burc H, Dursun M, Orhun Gurkan V, Bayhan I. Treatment of adult tibial diaphysis fractures with reamed and locked intramedullary nailing. Acta Orthop Traumatol Turc 2009; 43:7–13. Nork SE, Barei DP, Schildhauer TA, Agel J, Holt SK, Schrick JL, Sangeorzan BJ. Intramedullary nailing of proximal quarter tibial fractures. J Orthop Trauma 2006; 20:523–528. Ricci WM, O’Boyle M, Borrelli J, Bellabarba C, Sanders R. Fractures of the proximal third of the tibial shaft treated with intramedullary nails and blocking screws. J Orthop Trauma 2001; 15:264–270. Lang GJ, Cohen BE, Bosse MJ, Kellam JF. Proximal third tibial shaft fractures. Should they be nailed? Clin Orthop Relat Res 1995; (315):64–74. Buehler KC, Green J, Woll TS, Duwelius PJ. A technique for intramedullary nailing of proximal third tibia fractures. J Orthop Trauma 1997; 11:218–223. Russo CR, Lauretani F, Seeman E, Bartali B, Bandinelli S, Di Iorio A et al. Structural adaptations to bone loss in aging men and women. Bone 2006; 38:112–118. Robinson CM, McLauchlan GJ, McLean IP, Court-Brown CM Distal metaphyseal fractures of the tibia with minimal involvement of the ankle. Classification and treatment by locked intramedullary nailing. J Bone Joint Surg Br 1995; 77:781–787. Dogra AS, Ruiz AL, Thompson NS, Nolan PC. Dia-metaphyseal distal tibial fractures − treatment with a shortened intramedullary nail: a review of 15 cases. Injury 2000; 31:799–804. Gorczyca JT, McKale J, Pugh K, Pienkowski D. Modified tibial nails for treating distal tibia fractures. J Orthop Trauma 2002; 16:18–22. Seyhan M, Kocaoglu B, Gereli A, Nalbantoglu U, Turkmen M. Treatment for distal tibial fractures with intramedullary nails and blocking screws. Eur J Orthop Surg Traumatol 2012; 22:395–401.